The capital of Norway and a true beautiful city. The center can be explored by foot, thanks to the numerous pathways and trails connecting big parts of the city. There are also many pedestrian friendly areas, including the main street. There are many sites to visit here and if you want to explore the surroundings, a good way to do so is by renting a car. Filled with natural flora and fauna in the midst of its sprawling suburbs, Oslo, the capital of Norway is as unique as it gets! You will perhaps, never be able to vacation in a destination that has subway services to forests, hiking trails and skiing right there in the city. Oslo is also known for its excellent memorials, museums and cultural monuments with rich Scandinavian influences and we can take you around this buzzing city in one of our best Oslo car rentals. In the huge mountain stretch at Holemnkolen, you’ll have perfect skiing trails, trekking and hiking taverns and abundant wildlife and plant life to make your visit worthwhile. You might consider visiting the skiing museum for an insight into the sport. A ride in the mountains with one of our car hire services is a great way to spend a day in Oslo. Another great attraction is The Aula: The Great Hall. Come here to see the magnificent murals of the Sun painted by the famous Scandinavian painter Munch, if not for anything else! Otherwise, this structure is an enormously built one with intrinsic design and complex geometries. Before shifting their venue to the City Hall in Stockholm, the Nobel Prize awardees were honoured here, in this hall. The Opera House is a newly constructed addition to the city’s already eclectic skyline. Inaugurated by the Norwegian King in 1990, the Opera Hall possesses great engineering; technical and acoustic design and is a premier hall for concerts, jazz shows and the theatre opera evenings. With plush gardens, lovely promenades, restaurants and cafes in addition to the thrill of walking on the roof, the Opera House is a must visit place in Oslo. Akershus Castle has braved a whole lot of natural and manmade tragedies and stands tall today at a short distance away from Oslo. The castle extends to a great height and offers panoramic views of the city and the mind blowing countryside. There is a tiny fortress also in addition to the castle that was built by King Hakon V to protect Akershus from siege. Tour around the countryside using car hire to get the most of all this wonderful region has to offer. In addition to bearing some of the best pastoral sights and historical avenues, downtown Oslo remains a cosmopolitan centre with scores of shopping malls, parlours and a heady nightlife. 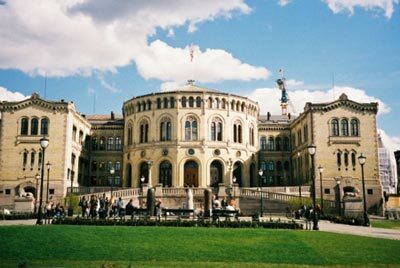 With our affordable car rentals in hand, you can explore Oslo and savour the essence of the city. To drive in Olso you need to be at least 21 years old with a minimum of one year’s driving experience, however a young drivers fee may apply for drivers below 25 years. Please check the detailed rental terms for the extra young drivers fee. At Oslo Airport are several ways to get to and from the airport. Check the corresponding time table for the departure times of the buses and trains. Another option is to go by taxi which will be more expensive but more direct. When traveling we advise to carry some Norwegian Kroner to avoid any unwanted surprises. At Oslo Airport there are Money Exchange offices in order to change your local currency. The local time code for Oslo is CEST. When traveling to Oslo make sure to check the local weather conditions in order to avoid any unpleasant surprises. Oslo has approximately 658,390 inhabitants. Parking your rental car in Oslo Airport can best be done in a garage. Its safer for you and your rental car. There might be the possibility to park your rental car in the outskirts of Oslo Airport and move around by public transportation which is not too expensive and will compensate for the parking fee you will need to pay if parking in the city center. Take in mind that many big cities have a city center only accessible for locals or delivery purposes. Last month, the average car rental length at Oslo Airport was 7 days. The average rental car length at Oslo Airport is 7 days. The most booked rental car type currently at Oslo Airport is COMPACT cars. Last year, the most booked rental car type at Oslo Airport were ECONOMY cars. How much does it cost to rent a car at Oslo Airport? Last month, the average car rental price was 544 USD. Last year, how much did it cost to rent a car at Oslo Airport? Last year, the average car rental price was 651 USD. What is the current average daily price to rent a at Oslo Airport? Last month, the average rental price was 74 USD per day. How much did it cost to rent a car at Oslo Airport over the past 12 months? Last Year, the average rental price was 96 USD per day. The car rental companies available at Oslo Airport are: . See below last 5 customer reviews. Our customers rated Oslo Car Rental with an average of 8.40 based on 5 ratings. Positive: cartrawler gave better conditions than many other booking sites because the offer included unlimited milage. also positive: the confirmation voucher was sent within a couple of minutes after booking was completed. that was important in my case as i have been booking late. terms and conditions were very clearly stated.rnnot entirely positive: the car provided by the local supplier was a c4 cactus which formally is a c4 as offered, but much more basic than a regular c4 and not as comfortable. besides, the cactus is underpowered. however, the vehicle was new and had a very low petrol consumption. overall it was a good offer and good rental experience. in all, i would consider cartrawler again. Everything was great, the only problem we've found was that the agency is not in the airport. even though, there's a free bus stopping there and it's just one stop. Sixts rented us a 7-passenger wagon (hard to find) in oslo, for 2 weeks. i wish they had let us waive the mandatory $1900 deductible, as we are fully insured through our visa card, but they did not. also, i wish they had warned us about the speed cameras just outside the airport. otherwise, good experience, pleasant clerk at the counter. The car was new, beautiful, but as usual without any explanation to help you to start. they provide gps but put the wrong hotel adress and still in native language. there is no common check list, before and after.